So many of the Villain’s Month titles released in the last two weeks have been origin stories for the various villains featured in those issues. James Tynion IV’s contribution is no different. In this issue, he gives us another snapshot of the state of things in Gotham given the disappearance of both Batman and Nightwing, with the status of the Birds of Prey, Batwoman and Batgirl unknown. The city is tearing itself apart, as we’ve seen in The Dark Knight #23.1: The Ventriloquist, The Dark Knight #23.2: Mr. Freeze and Detective Comics #23.1: Poison Ivy. In this state of things, the Court is folding in upon itself, and doing what it does best, staying hidden in the shadows. What I loved about this title was that it was extremely bleak, even for a Gotham title. Of course, a script has a lot to do with that tonal context, but penciller Jorge Lucas and colourist Dave McCaig also deserve a lot of the praise. 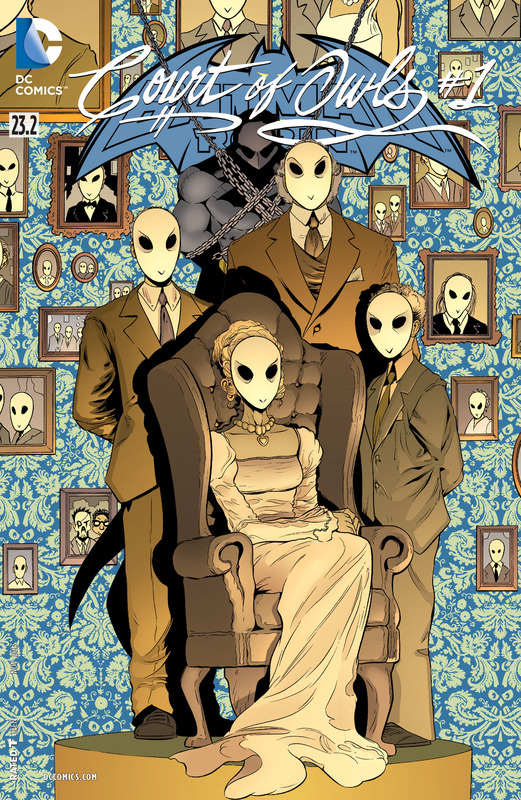 Their art matches James’ script beat for beat, telling a really dark and seedy tale of Gotham’s history as influenced by the Court of Owls and their agents. Whether it is silencing journalists and inquisitive police commissioners, putting down out-of-control Talons or getting recalcitrant mayors to cooperate, the Court has had a long and checkered history in Gotham. It really is the scale of things, and time, that make this issue stand-out. The Court has been a cancer at the heart of the city ever since its earliest days, and that’s what James explores here. Mixing in a slight progression of current story and all the flashbacks, James tells a very compelling and immersive story that makes this one of the best issues of Villain’s Month so far. Like I’ve already said, the art is not lacking either. While not being an explicit horror story, Lucas and McCaig’s art certainly makes it so. They emphasize all the shadows and darkness of each panel. Each panel evokes dread and anticipation like any great thriller or horror movie/novel. And some of the panels have a very pulp vibe to them as well. Really great stuff here. Dave McCaig especially deserves praise because of his adaptability to different books. He did the colours for Justin Gray and Jimmy Palmiotti’s The Dark Knight #23.2: Mr. Freeze as well, so it really does speak to how talented he is, given the huge difference in the colour palettes between that issue and this one. Overall, I loved the dark vibe to the issue. James builds on everything that Scott Snyder did with the Court in his first eleven issues of the New 52 version of Batman and what he has been doing in Talon as well. And all the mood developed by the artists totally rocks things as well. Given how this issue ends, I really want to catch-up on Talon now, and see how James furthers that title within the context of the ongoing Forever Evil event. If there are any negatives to the issue at all, there’s only one: the first few panels are slightly inconsistent in terms of pencils. More Batman Villain’s Month issues: Two Face, Joker, Ventriloquist., Mr. Freeze. Posted on September 17, 2013, in 2013 Reading Challenge, 2013 Writing Challenge, Challenges, Comics Reviews, Review Central and tagged 2013 Reading Challenge, 2013 Writing Challenge, Batman, Batman and Robin, Challenges, Comics, Comics Reviews, Court of Owls, Dave McCaig, DC Comics, Gotham, James Tynion IV, Jorge Lucas, Review Central, Reviews, Talons, Villain's Month. Bookmark the permalink. 2 Comments.